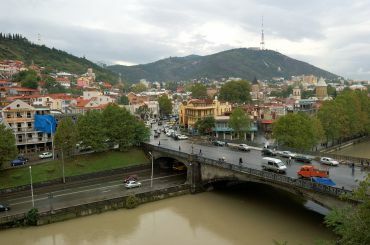 Tbilisi , capital of Georgia with a long history and unique culture to this day fascinates many travelers. A huge number of ancient monuments of architecture on the background of beautiful nature, picturesque Georgian streets of the old city - all worth seeing guests. 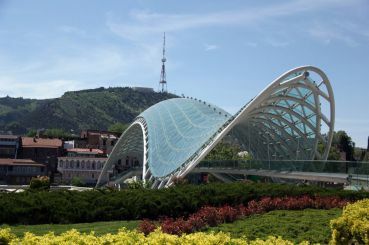 In recent years, Tbilisi has become a rapidly changing. Its architecture began to appear modern buildings of glass and plastic, which does not quite fit into the old neighborhood. 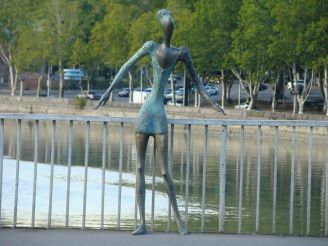 Still need a novelty - this expresses the desire of the city to the present, to a better future. 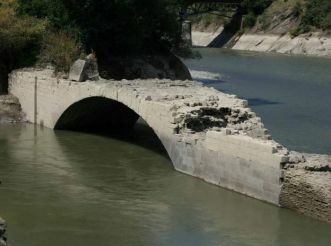 Not so long ago, in May 2010, joined the two banks of the Kura River bridge undulating glass of the World, which caused a lot of debate among the townspeople. 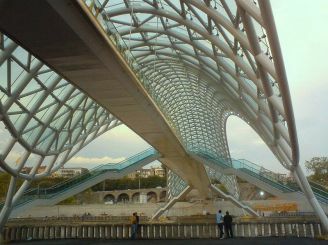 This pedestrian bridge, 156 meters long, united Irakli II street and park Rica. 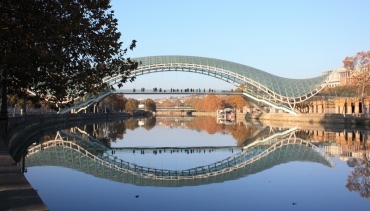 Bridge has become a bridge between the past and the future of the city. 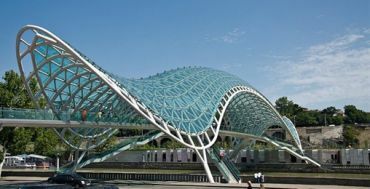 Creator of the bridge is an Italian architect Michele De Lucchi and lighting engaged French designer Philippe Martineau. The steel structure of the bridge has a unique light illumination - 30,000 bulbs each hour broadcast a message in Morse code on the parapets of the bridge, consisting of the names of the elements of the periodic table, from which a man. According to the author, this message is a hymn to life and peace between nations. At night, the bridge looks fantastic thanks to the blue backlit, consisting of a large number of lamps and LED lighting that resembles a laser show. Bridge of Peace harmoniously into the night Tbilisi, affects all its radiance and illumination, and is one of the favorite places of the townspeople. 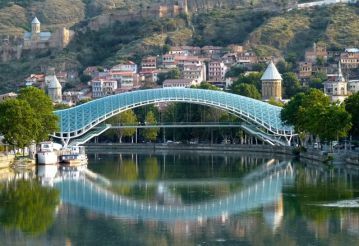 Today, many believe that the Peace Bridge has become a business card of Tbilisi and is included in the obligatory visit for tourists, where you can take great photos with stunning views of the capital of Georgia.